A panel discussion on the rise of the far right, neoliberalism in Aotearoa and globally, and resistance to these forces. Organised by Anti-Racist Action (Christchurch). A rather depressing snapshot of where the left is at today. On the face of it all worthy stuff, getting some real action going against the bad people. Or tilting at ethereal enemies that everyone this side of fascism can unite against while giving Labour out of office a free facelift and leg up for the next election? In honest working class terms, the far right is an inherent and inescapable part of the NZLP. Read that history about racism and economics. This latest panel discussion soft soap formula is not new. “Neoliberalism” is today’s shamefaced euphemism for capitalism. Not the first. In the late ’70’s the union office version was opposing Transnational companies supposedly owing no alliegiance to nation states. A great out for not only US imperialism but also NZ imperialism. When will we get off the treadmill, examine what’s going on before us and try to answer the hard questions? I’m sure Thomas will make that point at the meeting. Anti-Racist Action is an umbrella group, not a cadre Marxist group, and there are Young Labour people involved. 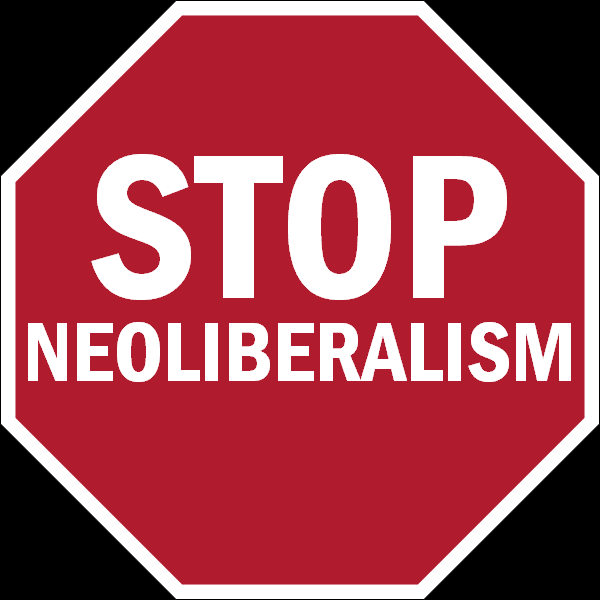 And neoliberalism is not a euphemism for capitalism, it is an era of capitalism. Fightback doesn’t shy away from using either term. This “era of capitalism” called “neo-liberalism”?. . . Are we now out of the era of imperialism and in a new era, that of “neo-liberalism”? Or is it a sub-era of the era of imperialism? And if we’re in an era of “neo-liberalism” it seems odd that the Nats are not doing what the *actual* neo-liberal ideas are all about – the kind of things which the fourth Labour and National governments did, for instance. Some people need to find out a bit more about what neo-liberalism is and then measure National policy against those ideas. The soft soap is added to by having someone from the Labour Party as a speaker. The Labour Party is one of the two main capitlaist parties operating and implementing racist immigration controls. Inviting along a member of one of the parties responsible for racism simply obnscures the nature of the Labour Party and makes it look like Labour is part of the same team as us. It’s interesting, too, that there is a Labour speaker but not a Fightback speaker. The notion of the “rise of the far right” is also nonsense. The tiny fascist movement in NZ is no bigger – in fact it’s probabl;y smaller – than it was ten years ago. It has no power to make policy or affect policy and it has no support in any section of the ruling class. But banging on about a non-existent danger has its uses for the wobblier sections of the far left, since it allows them to unite with Labourites, liberals and so on, and make them feel they are part of something bigger. In fact, all it does it show up their inability to analyse where the actual ruling class is at today and how they (the ostensibly revolutionary left) are quite politically mushy. That Fightback has become part of this mush would seem to be further indication of the group’s drift into the swamp left. I think the fact that members of the Labour Party, with its long record of racist immigration controls (not to mention Shearer’s latest on housing), feel comfortable in this group indicates how it poses no challenge to the existing system and the parties that prop it up. 99.99% of the population are against nazis and wouldbe nazis, so there’s no real class/revolutionary politics there at all. Andrew and I organised this event to represent who came out to rally against the Nazis when they had their white pride rally. A great number of young labourites came to that, so it would be pretty stupid not to include them under the Anti-Racist Action group, which is a broad and, frankly, non revolutionary group. Does that mean what’s going to be discussed has no value? Because some teenagers are coming along to a panel discussion? Do you see Fightback’s name actually in any of the descriptions of this event? To say that the far right haven’t grown in NZ is probably true. However, considering EDL/BNP in Britain and Golden Dawn in Greece, the French teenager who was beaten to death by neo-Nazis, the idea that somehow the far right isn’t a threat at all and it’s a waste of time talking about it seems myopic if not completely provincial. Labour will no doubt take some harsh criticism tonight, but I’m sure if you were speaking you’d be sure the three adult Marxists on the panel really ripped into the teenager involved in Young Labour. That would be effective. That would definitely have a point. I’m branch organizer for Fightback CHCH and will be addressing what I have time to address in terms of class struggle, labour’s role, etc. But mostly because I created the facebook page for the anti-racism group I am aiming just to facilitate a discussion. No idea what narrative you seem to have constructed about, well.. everything, but it seems far away from the reality. Also, it seem embarrassing when leftists just want to go “capitalism is still capitalism” a though different dominant ideological elements are meaningless. Obviously ideas do not control history, but neoliberal ideology is engrained into every institution we deal with, and not focussing on how we can best counter that propaganda is just backwards looking “hold the line and the party will grow!” Nonsense. How’s that worked out for everyone? Actually, it’s ranting about neo-liberalism that hasn’t worked out well for its practitioners. Your views are curiously late 1980s-ish. What is needed is a critique of the current ideology and practice of the ruling class, not one they moved on from over 15 years ago. Attacking ‘neo-liberalism’ is truly backwards looking – and boxing at shadows. For instance, neo-nazis have been trying to organise in Christchurch for decades. They have failed spectacularly. Why? Same in every other city in New Zealand. Why? To answer that you need not an analysis of the current state of Greek society, but an analysis of the current state of NZ society and where the ruling class is at here, etc. One of the things Marxism does is enable us to ask the right questions, the ones that go deeper, rather than getting too excited about the (more minor) diversions. Surely inviting Labour hacks to speak at an anti racist event is playing into the hands of Kyle Chapman and co, who will say (correctly) that you are inviting the very people who introduced neoliberalism to NZ. Kyle chapman and co like to think the left are in bed with the ruling class and dont care about working class people. I agree with Phil and Don that the fascists are not a threat but that doesnt mean we have to do their recruiting for them by inviting the labour party to an anti racist event!! Perhaps if the labour speaker actually though labour was any good you’d be right. Alistairs was openly critical. How many former labour supporters have moved to the radical left? Thomas , that is not what’s out there. Think about what you said. If true it could only presuppose some sort of crazy robot society. I disagree. I’m not much an economist but I see neoliberalism as a sort of fanatical free trade , free every capitalist state concept, and the devil take care of the welfare state, something like that. Yesterday I go a letter from the government in my letter box asking me to sigh up for a pension because I am now old enough. That is not the hardest out capitalism is it? What is your definition of neoliberalism? We need to clarify our terms. And we need to get an understanding that we are having a debate to get to the truth not to score points. My original post was a bit prickly, I wrote it when I was tired and cross, I still mean every word of it but it wasn’t meant to be personal. I think your original assumptions were faulty as well. I doubt anyone who attended would say that Labour got a facelift just because on representative from Young Labour came along and basically joined in a scathing critique of where Labour is now. Heaven forbid some kids who happen to be signed up to a bad political party come along to a socialist meeting! Keep them out! More what I mean is that, are any institutions in society moving in a progressive direction at all? I would argue no.. all are becoming more and more built around privatization, markets forces, etc. Are we in a fully neoliberal era? Of course not, because it’s not possible? Do we actually now subscribe to the idea that even on Capitalist terms, free market capitalism technically works? It doesn’t, their own theorists basically admitted it too up until the bizarre dogma of Hayek etc. So, in other words Thomas, we aren’t living in a new epoch of capitalism called neo-liberalism (as ian suggested)! We are, presumably, still in the epoch of imperialism. Neo-liberal ideas dominated government policy, and much of the business sector here, from the mid-1980s for about a decade. The reason is that they coincided with the material needs of capital at that time. But the interests of capital today requires different kinds of policies. No government since the mid-1990s has subscribed to neo-liberalism. And there is hardly a serious economist in NZ today who advocates neo-liberal policies. 3. It operates as a form of abuse in the way that some on the left called Muldoon a ‘fascist’. It may be trendy to talk about the demand side more in bourgeois circles now, and we’ve gone from “Third Way” to talk of Keynes and even Marx. But real wages have declined consistently in the past 30 years, contrary to all this talk of addressing the demand side. In large part this is because of the continued strategy of both undermining collective bargaining and using unemployed/beneficiaries as a disciplinary tool, which may not be stated as cravenly as it was in the Don Brash Reserve Bank days, but remains a key strategy. Along with the extension of credit and further commercialisation of services, to cover the decline in real production. True, they don’t have to go on the offensive to the same degree they did in the late ’80s or 1991, but that’s in large part because those attacks remain entrenched. There have certainly been employer efforts to extend the casualisation of work into core industrial sectors (meat works, ports) and into the public sector. What’s your evidence of a move away from neoliberalism? Don makes the point that “pure” neoliberalism does not exist, but of course it has never existed. In A Brief History of Neoliberalism David Harvey makes quite explicit that neoliberalism is defined not by the absence of state intervention, but by the form of state intervention. Ina, real wages declined in New Zealand *before* neo-liberalism and after it, as well as during it. The extension of credit has been occurring ever since credit existed. it’s not a specificlaly neo-liberal policy. Capitalists also nationalise and privatise as the needs of capital dictate. Are you really claiming that the government or any significant section of the ruling class or any significant section of economic commentators in NZ are advocating and pushing thorugh neo-liberal policies in 2013. One of the problems is that you have widened the definition of neo-liberalism so much as to make it almost meaningless. If cutting wages and undermining collective bargaining, expanding credit and commercialising services constitutes neo-liberalism, then neo-liberalism must have arrived with the dawn of industrial capitalism and in and out of dominance ever since. A much better way of approaching the issue is to look at the process of capital accumulation as the starting point and consider which policies are necessary at different stages of the accumulation cycle and whenever the accumulation cycle breaks down. There is a whole range of mix-and-match policies which capital requires and uses. The capitalist class is much more flexible and nuanced than if they were all lined up to create a whole new era behind one particular set of rigid policy prescriptions like neo-liberalism. Also, you didn’t address the issue of the era of imperialism. Is that era now over and we’re in a new era, that of neo-liberalism? The financialisation of the world economy (imperialism) is perfectly compatible with the neoliberal organisation of work and state particularly in the imperialist core. Just because Lenin said imperialism was the highest stage, doesn’t mean there are no other aspects to how the era plays out. The disciplinary use of unemployment is clearly distinct from the Keynesian use of full-employment and corporatism to prop up the demand side, although granted it’s something Marx described in the 19th Century. But the global flexibilisation of labour (enabled, yes, by imperialism) is distinct from earlier capitalism. If Keynesianism was imperialism, and neoliberalism was imperialism, is there no concrete difference between Keynesianism and neoliberalism? Ian, you still haven’t answered whether what you call the era of neoliberalism has replaced the era of imperialism. Or are you suggesting the ‘era of neoliberalism’ is a kind of ‘sub-era’ within the era of imperialism. Global flexibilisation of labour is also not new. The rise of imperialism at the end of the 1800s created a new global division of labour. Indeed, even before imperialism, capitalists from the European powers were creating factories with very specific forms of labour in their colonial possessions. And they separated sizeable sections of indigenous populations from their means of production (the land) and forcibly converted them into being wage-labourers. Nothing that you have indicated as a key characteristic of neo-liberalism, and which would therefore justify referring to it as some sort of new era, is actually new or distinctive. Academic marxists like to come up with these things because this kind of stuff justifies their existence and makes them look like ‘original thinkers’ (Marx never quite being good enough), but you take too much of it too seriously. So do you have no term to distinguish between Keynesianism and post-Keynesianism? Just a declaration that Marx and Lenin give us sufficient categories? Ian, there have actually been a series of different *policy prescriptions* pursued since WW2, all within the era of imperialism. Keynesianism was the dominant policy prescription during the postwar boom but the consensus around it (Nixon declared in 1968, “We’re all Keynesians now”) came unstuck with the end of the postwar boom. Keynesian ‘solutions’ worsened rather than improved the situation. A massive attack on the rights and living standards of the working class was needed, so policy-makers shifted to whatever economic ‘theory’ suited the needs of the working class. Monetarism, neo-liberalism, Third Way, etc. These are *policy prescriptions*, not new eras. Neo-liberalism was more dominant in NZ than just about anywhere else in the world. It was almost totally dominant as the policy prescription here from about 1984-1993. When Bolger sacked Richardson and Shipley, it was an indication that the tide was going out on neo-liberalism. The Business Roundtable, which seems to have just about written government policy in the late 1980s and early 1990s, started to become persona non grata and was thoroughly marginalised within a few years. Roger Kerr, who had occupied a special guest status at any and every significant state gathering about the economy, found himself off the guest list and reduced to standing outside handing out leaflets. Bolger’s ‘big new idea’ was ‘social capital’, but it never really took off and the Nats cast around in vain for a new coherent economic policy, while the ruling class became frustrated and switched back to their B team, Labour. Keynesianism and neo-liberalism *are* useful terms. But they are useful for *accurately describing* and *differentiating between* various policy prescriptions followed by the capitalists. But they aren’t some kind of mode of production within the capitalist mode of production or some kind of era, like the era of imperialism. They are sets of *policies* which have particular uses, and play particular roles, at particular times. The problem for the neo-liberal ideologues is that they were only used to provide an intellectual veneer for the what the capitalist class wanted and needed to do – raise the rate of profit by driving down the price of labour-power and cutting the level of surplus-value that was siphoned off by the state for activities that didn’t directly create surplus-value (like educating people, helping sick people get well, providing a very modest safety net for the unemployed, solo parents, and so on. The ruling class succeeded in driving down the price of labour-power, saw off much of the trade union movement, removed a bunch of regulations which slowed down the accumulation cycle and/or had some other negative effect on profitability, sold off parts of the operations of the state which could be turned into private-profit and commodified other parts of the old government departments which could be run profitably by the state, etc etc. But having done all that, and tried to consolidate opinion behind those measures by converting people to neo-liberal ideology (or at least converting them to the idea that there was no alternative), the NZ economy remained rather stagnant. Under the banner (or guise) of neo-liberalism all the ‘obstacles’ to a dynamic new round of accumulation had been removed, yet there was no new dynamic round of accumulation. That’s why the ruing class *abandoned* neo-liberalism and cast around for new policy prescriptions and new thinkers and think tanks to provide them (folks like the New Zaland Institute, who were very much postneo-liberal). BR, on its last legs, eventually merged – or, perhaps more accurateoly, had to dissolve into the NZI which was relaunched as the New Zealand Initiative. Of course, neither Labour nor National have (or are ever likely to) roll back all the neo-liberal reforms. They’ve basically rolled back a few of the ones which, from the standpoint of capital as a whole, had to be rolled back because otherwise this or that enterprise wuld collapse (Air NZ and rail being good examples). But, essentially, they have incorporated and superceded neo-liberal reforms. The private-public partnerships are a good example. That’s not neo-liberal theory in practice, but those partnerships will operate on a totally capitalist basis, just like the state assets that Key is selling 49% of the shares in. Sorry this has been such a long response, but short responses can often lead to crossed wires and sound snippy. Oops. I wrote: “so policy-makers shifted to whatever economic ‘theory’ suited the needs of the working class”. Of course, that should have been whatever economic ‘theory’ suited the needs of the ruling class!! !